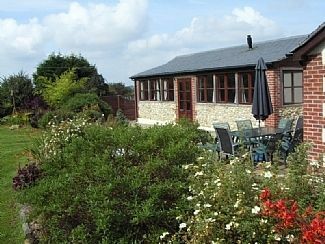 Holiday Home near Stockland, Honiton, Devon - Set in Picturesque Countryside, The Property is Light and Spacious. Great reductions on late deals. Awarded 5* by British Tourism, all bedrooms are en-suite, making it very accommodating for sharing families, couples, friends or groups. Michael's Port is located within the beautiful Devon countryside. It's easily accessible with the M5 only 20 mins away and the A303 5 mins away. There are many walks to enjoy on our doorstep, with streams, woodland and fields. There is plenty to do locally, Exeter with its new shopping centre, Creally and Diggerland for the kids and a wealth of historic towns and villages. The property is 20mins away from the Jurassic coast. Lyme Regis and Sidmouth are fantastic for all ages with interesting shops to explore, fossiling or enjoy the beach. This spacious and comfortable property enjoys a secure, private and established garden. Michael's Port has plenty of natural light, the decor is neutral and has a mixture of antique and modern furniture. It has much to offer for your holiday. David & Sylvia have lived at the Rising Sun for 20 years and converted Michael's Port themselves. They have taken great pride in making the property suitable for all ages and feel thats its the perfect place for young and old to holiday together. Kate their daughter-in-law helps manage the property and has a keen eye on any questions and queries are responded to promptly. The owners feel that Michael's Port is a great location to explore all that Devon has to offer and we are always on hand to help with making the most of your holiday. Bedroom 1 with en-suite bath, sink and toilet. Bedroom 2 with en-suite bath, sink and toilet. Bedroom 3 with en-suite shower, sink and toilet. Bedroom 4 with en-suite shower, sink and toilet. Separate ground floor toilet and sink. With 3 sofas facing patio doors to garden, oak floor and furniture. Large 28'' TV, Freeview and DVD. Solid pine fitted kitchen with granite worktops, range cooker, fridge and mini fridge, freezer, microwave and dishwasher. Plenty of room for storage with island. Far end of kitchen is dinning area with table and chairs. WIFI available here only. Honiton Golf Course is 20 mins away and is well worth a visit. There are many more within an hour's drive. Notes on accommodation: The property has timed central heating and can be adjusted if required. There is 1 double and twin bedroom up a flight of stairs, the remaining bedrooms have one step-down. All bedrooms are carpeted, bathrooms and living areas are hard floors with rugs. Children of all ages are welcome and no problems from previous families have been given. There is ample off-road parking for 4 cars, access is shared with the owners property. Outside: 3 separate patio doors from the kitchen and living room open onto large patio area with table, chairs and parasol. There is a barbecue (charcoal) and more seating so you can enjoy alfresco dining. The established garden is a combination of shrubs and flowers and is a haven for the local wildlife. There is a bird table and bath so you can encourage any feathered visitors. The large lawn is ample for ball games and is south facing for sun worshippers. There is a shared driveway and yard which overlooks a 2 acre garden that is also available for you to explore and enjoy. Utility Room: Washing machine, tumble dryer and storage space. Cleaning / Towels / Linen / Maid service: All linen and towels are provided, and changed weekly. Other: Main entrance leads into large glass walkway overlooking private garden. With CD player, tables and chairs, and some books and games, its another area to enjoy the space and light that Michael's Port gives. Party of 8 of mixed ages all with en-suite rooms - so essential when 3 families sharing. Well furnished and equipped but I found the bed only a standard double and not particularly comfortable. Garden very nice. Only negative the road that passes by all vehicles use as a race track and the open drive/courtyard catch draft and make a continuous noise starting quite early in the morning. Easy to visit many places. We stayed here to celebrate my 40th Birthday. There were 7 of us in total plus our dog. The house was huge and really nicely decorated with everything thing you could wish for. It really was like a home from home. The kitchen was very well stocked with everything we needed to cook and eat together. We did fajitas one night and perhaps the knives could have been sharper, it was a struggle chopping onions and peppers with blunt knives but having the space for all of us to help out and sit and eat together was the main reason we chose this place. It was very comfortable, I had the master bedroom with the lovely big, deep bath and really enjoyed using that each morning. My only tiny disappointment was with the pillows, they were very flat! I had to borrow a couple from the spare bed! My fault though as I usually bring my own but forgot this time! The secure and secluded garden was heavenly and our dog was happy as Larry mooching about there and we spent a lovely afternoon sat in the sun together sharing some wine and chatting together. This place really let us do what we envisioned we’d do for my birthday so it really was perfect. It is right on quite a fast road and it took us a night to get used to the sound of the traffic but the beds were comfy and we soon got used to it. We had a lovely meal out at The Holt in Honiton and got a taxi there and back, it wasn’t far and meant we could all have a drink to celebrate my birthday. It was a great location to explore, we drove to Branscombe and took the coastal path to Beer and back again and had a really good time. Overall, Michaels Port was a perfect base for our little trip, had the space and comfort we wanted and everyone really enjoyed themselves. We highly recommend this place and would happily book here again. Thanks for a lovely time away celebrating my birthday! We really enjoyed our stay in this property.Extremely well equipped and spacious and a great location. We had a wonderful stay over a very stormy new years weekend. The house is beautiful and had plenty of space for the kids to run free and play even though the weather meant we weren't outside much. The excellently equipped kitchen and big table was great for big family meals and socialising space whilst doing the cooking. It was also so lovely to have all the Christmas decorations and lights up! Beautiful home from home in great location. The house is perfect for groups of people wanting a home from home place to stay. The house was clean and had everything we needed. The bedrooms were spacious with the added bonus of each having its own ensuite. Garden is lovely and the patio area ideal for the summer evenings. Location is great to explore all different areas surrounding the house. Would definitely recommend and return in the future. The nearest beaches are Lyme Regis and Sidmouth and are a 20 mins drive away. Lyme Regis is a popular resort with newly improve bathing area, unique shops and fabulous seafood restaurants. There is opportunity to go mackerel or deep sea fishing, with private boat hire as an option. Monmouth beach (Lyme Regis) enables you to try free fossiling. Sidmouth, Branscombe and Beer are all 30 mins away and are picturesque seaside towns and villages, to explore the local pubs, shops and restaurants. Exeter International Airport is 20 mins drive away. Due to the isolated position of Michael's Port it is advised that you have your own transport. Bristol is 90 mins drive away, Taunton 30 mins (M5 0, Exeter 30mins, Honiton 15 mins, Axminster is 20 mins. Sockland village is 10 mins drive away, or a very relaxing and beautiful hour's walk. This pretty village has a charming pub 'The Kings Arms' and is worth a visit for a meal. Honiton has all the major banks, Tesco's, M&S simple foods and is famous for its antique shops and market. Axminster also has all the local amenities and the new arrival of 'River Cottage' shop and restaurant. There are many walks to take advantage of, local countryside, coastal and an hours drive will find you in the breath-taking Exmoor or Dartmoor National Parks. There is plenty to do for most interests from fishing, horse-riding, water-sports, nature and fun parks, we have plenty of up to date tourist information that can help make the most of your stay. Finally, in the warmer months there is plenty of local festivals, shows and events that encompass various interests and hobbies. We would be happy to update you on whats. A welcome pack is provided and the property is stocked with the basics to get you started (toilet rolls, tea/coffee, soap, cleaning products). Booking Notes: Please check for availability on calender, phone for short notice breaks to double check. A 25% deposit is required on booking, payments by cheque. Full payments to be received 8 weeks prior to your arrival with us. For late bookings, full payment on booking Michael's Port please. Changeover Day: Holiday week is Friday to Friday ideally but we are able to negotiate if needed. Arrival is at 4pm and departure is at 10am. Notes on prices: Please note that prices for Min Stay 3 nights are for short breaks only, thus Friday to Monday or Monday to Friday. Price per night not given as depends on how many sharing, please contact the owner. No short breaks available in peak time (summer school holidays).